For retailers struggling to address the rise of the cyber consumer, slides from my latest talk at Cogent Elliott today may be a helpful guide to the essential thinking you need to adopt into your organisation. Key trends in consumer retail behaviour and a framework how to address them. What is happening at the intersection of in-store, ecommerce, mobile and social? 3 cyber consumer features – Connected, Tribal and In a Rush, 5 pains – physical blindness, information overload, choice overload, being part of the tribe and friction burns. 5 balms – tangibility, relevance, filters, tribal channels and frictionless user experiences. Talk given at Cogent Elliott in Birmingham. In the software world, it might not be your competitors who steal your lunch. It might be a company who doesn’t even compete for the same customers and revenue, who provides a free product so you end up losing out. Bing provides maps for free – that’s because Microsoft makes its money on desktop software and increasingly enterprise software. TheAA provides maps for free – it’s primary revenue model is roadside assistance insurance. So, wow, my old revenue model just got shot to pieces but not by direct competitors undercutting me, but by indirect competitors. So, in the software market, where feature copying is rife, (check out this discussion on Playfish v Zynga) everybody who is not my friend… is my enemy? 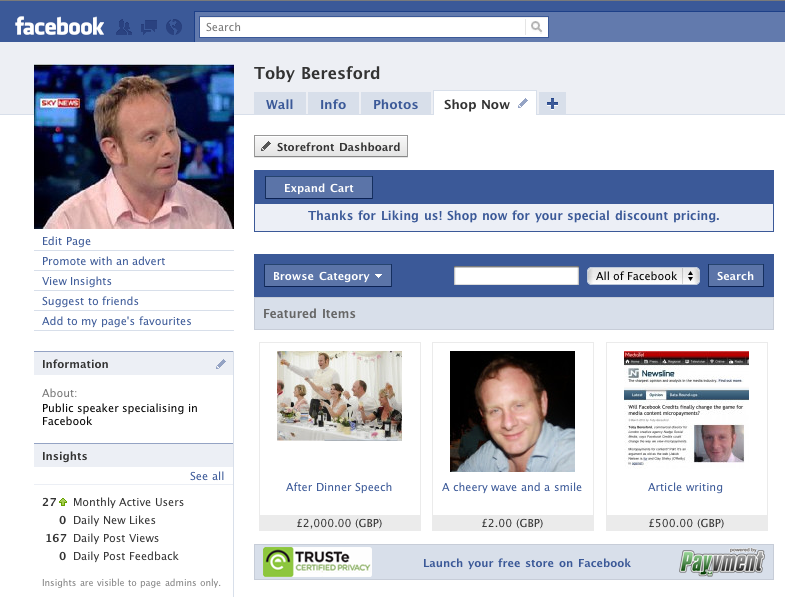 I’ve been playing around with Payvment recently on my, self styled, Facebook Public Figure profile. Of these, Wishpot is worth highlighting for bigger brands as it doesn’t try to rebuild the full ecommerce experience within the Facebook channel. For getting started with social likes around products it looks the right product. Notwithstanding Wishpot for companies with existing ecommerce sites, my personal storefront is up and running with Payvment, visit my Facebook shop and buy your first product within Facebook – for just £2 I’ll give you a cheery wave and a smile, digitally if necessary!